Why national parks now have signs that say "Caution! Stay on Trail"
You may have looked at the color photograph of Yosemite that serves as the header, or “flag”, on this blog and thought, “Tom bought a postcard in the gift shop.” It’s flattering that you would think that, but the truth is, I actually took that picture on one of our visits to Yosemite, back in 1984. That view is familiar, of course, with the massive granite wall known as El Capitan on the left, Half Dome in the center, and Bridalveil Fall on the right. Those are perhaps the best-known landmarks in the park, but they aren’t the only jaw-dropping vistas. Yosemite National Park is roughly the same size as the state of Rhode Island, and I mean no disrespect to the Ocean State when I say that when it comes to sheer physical beauty, Yosemite may have a slight advantage. In addition to the attractions mentioned above, there is Yosemite Falls, the highest waterfall in North America. There is the Mariposa Grove at the southern end of the park, with its giant sequoia trees. Vernal Fall… Nevada Fall… Glacier Point… Tuolomne Meadows… Mirror Lake… almost everywhere you look is scenery that inspires an “ohhh!” and provokes the impulse to click the shutter of your camera. The renowned landscape photographer Ansel Adams said, “A good photograph is knowing where to stand.” There are lots of great places to stand in Yosemite, and if you’re planning a visit there, here’s how you get to the place where I took the flag picture. Let’s assume you’re approaching the park from the south, on California Highway 41. After you enter the park, keep heading toward Yosemite Valley for, oh, I’d guess it’s about 25 miles. You’ll come to Wawona Tunnel, which is almost a mile long. As you emerge from the east end of the tunnel, believe me — you can’t miss this spectacular sight. There is a parking lot on the north side of the road which, depending on the time of year, may be full of tour buses and cars and people taking in the panorama. This spot is commonly known as Tunnel View, but the scenery is a whole lot better than that unimaginative name. You will not be the only one with a camera, looking for just the right place to stand. Unless you accidentally put your thumb over the lens, though, it’s almost impossible to take a bad photo from this spot. 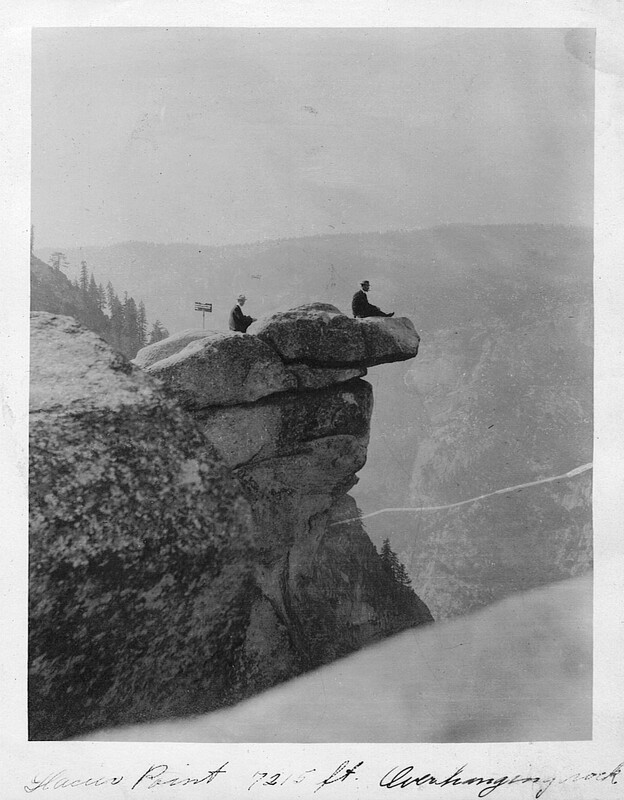 Now, as for the black-and-white image that accompanies this post… it was taken at Glacier Point in Yosemite by one of my wife’s ancestors, sometime during the 1920s. Sally found the photo in an old family album, but the photographer’s identity is a mystery. The names of the daredevils sitting on that rocky outcropping thousands of feet above the valley floor are also unknown. The one thing I can say with certainty is that you would never, ever catch me standing there. Or sitting there, for that matter. This entry was posted in Travel and tagged Yosemite. Bookmark the permalink.